This is the inspirational words from the #1 New York Times Bestseller Body for Life by Bill Phillips and Michael D’Orso. First of all I would like to explain to you more about body fat percentages, for some people don’t really know what to aim for. First of all every individual is different and everyone’s goals can differ. What is the ideal fat percentage for me isn’t necessary except able for you, so this will give you a good guide on what is Ideal for your age and your body. What is a healthy, realistic body fat percentage to aim for so you can have that lean, toned body you desire? When you’re in the risky high body fat category (represented by over 30% body for males and over 40% body fat for females) you’re going to see visible cellulite and excess fat all over the entire body. The body shape will look very round and often the body will bulge in certain places where the clothing is right around the skin. Those in the excess fat category have 21-30% body fat for males and 31-40% body fat for females and won’t have quite the degree of excess weight as those in the risky category but will still look largely overweight. These people may carry a decent amount of muscle mass, but it is for the most part covered in a thick layer of body fat as well. For those who want to take their body slightly further, you come to the lean category. This represents between 9-12% body fat for males or 19-22% body fat for females. At this point you will see clear muscle definition, often being able to clearly see where the muscle starts and ends. There will be little fat to pinch on the body and it will be clearly obvious these individuals are exercising regularly and following a strict diet. Then you have the ultra lean category, represented by 5-8% body fat for males and 15-18% body fat for females. This is typically where fitness and bodybuilding competitors are coming in, so muscle definition will be at its highest. Veins may start appearing at this stage and very little fat will be evident at all on the body. Note that females will not look as lean as males (as obvious by the difference in body fat percentages) but this is also because females will have more necessary body fat internally to help support their reproductive capabilities. It would be futile for a female to try and get to the same body fat level as a male as it is neither safe nor healthy. Finally there is the risky stage; less than 5% body fat for males and less than 15% body fat for females. At this point the individual is setting themselves up for a number of negative health consequences and could even risk death by staying at these extremely low levels for an extended period of time. In females, reproduction often ceases when body fat is at this level, setting you up for problems down the road. Now the next thing will be to set a realistic goal for myself and to work toward that. 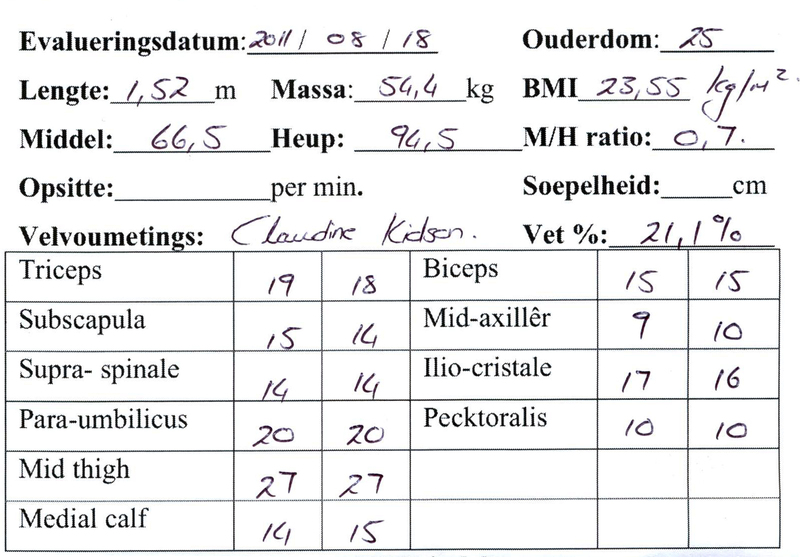 Setting realistic goals for oneself is what helps to motivate you when you track your results by doing a measurement every two weeks if possible. This will motivate you and give you the confidence to go forward and to work hard! I will take a before photograph tonight and then as I progress with the challenge. Posted on August 18, 2011, in Body fat measurement. Bookmark the permalink. Leave a comment.